Hello There! If you remember a couple of months back we started a series regarding the Google Cloud Connectors Suite. In the first post we introduced the suite, took a look at how to install the connectors in Studio and built a very simple yet cool iApp that takes contacts from a Google Spreadsheet and turns them into Salesforce contacts, Google Contacts, Google Calendar Events and Tasks. Then on the second post we gave some quick code examples of common usage on the connectors. On this post we’ll wrap up the series by discussing a very important element of the first post’s sample iApp: The DataMapper. If you’re not familiar with it you can find more information about it on its documentation page, but in a nutshell it’s Mulesoft tool for mapping complex data structures (XML, CSV, JSon, Pojos, Maps, Fix width record files, etc) into any other format while optionally adding some transformations on the way. 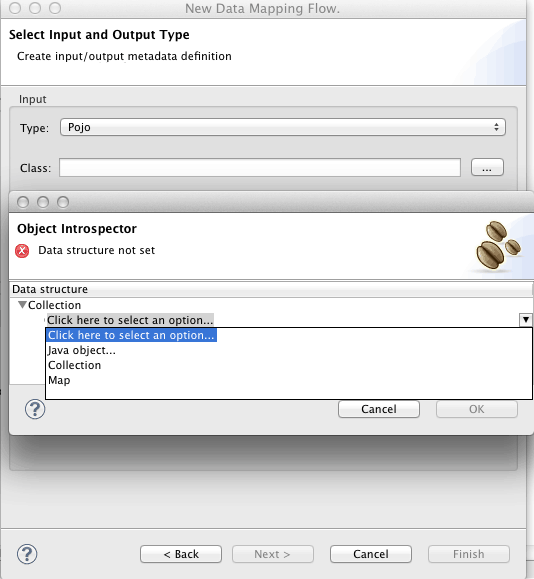 If you follow the documentation link you’ll find DataMapper most common use case scenarios. But here I’m going to show DataMapper in a different light: Uses of DataMapper that goes beyond the obvious. Why is DataMapper important to a Google Connectors series? Simple: Google has a gazillion of APIs. Each one targets a different set of business requirements and thus specifies its own domain model which in turn translates to different sets of data structures. 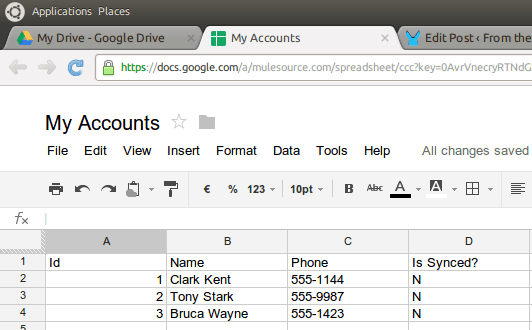 If like in our example you want to turn a spreadsheet row into a Google Contact, you’ll need to transform those different Pojos into instances of each other. Make no mistake: This is not something you need because Google APIs are so very different. 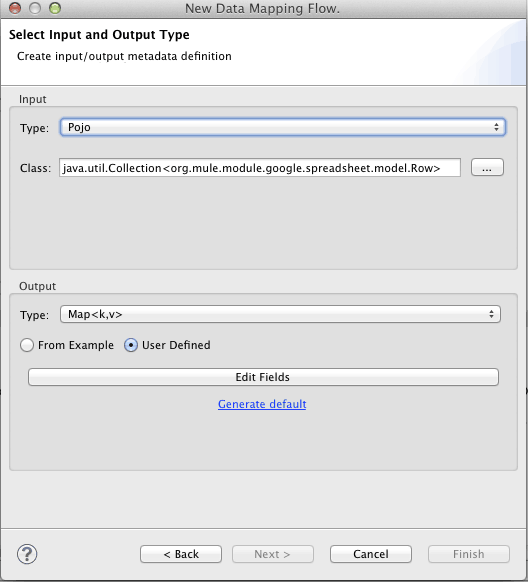 Most integration scenarios will require you to map different data formats into each other. The more complex the integration, the most often you’ll find yourself in this situation. For example, in our application we need to transform data from a Google Spreadsheet into a Map that Salesforce can read. Additionally, real life apps will have additional requirements like skipping certain records, adding transformation rules and so forth. These are the kind of stuff that we’re going to discuss on this post and that you will certainly need when combining more than one Google connector in the same app. 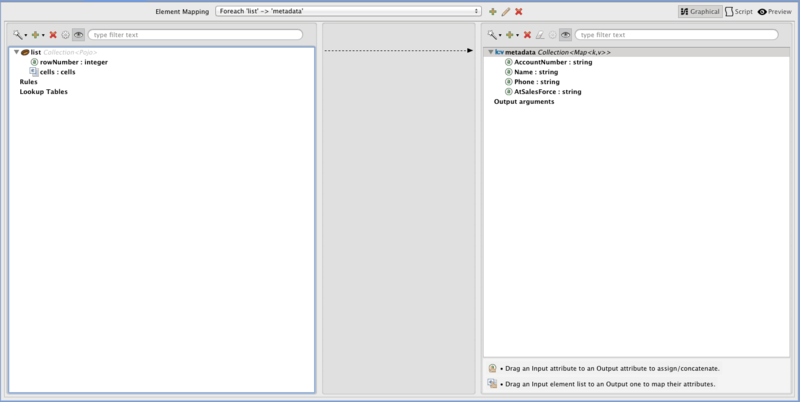 In the first example we’re going to show the rules feature in DataMapper. Rules are basically expressions that you apply into the source data. When evaluated, each of those rules generate a value that is then used on the output. So, let’s consider the first case in the example in which we have a list of Row objects that need to be transformed into a List of Maps. * The number of the row it belongs to. It's a 1-based index. * Defaults to zero which means that this is still unknown. * The number of the represented column. It's a 1-based index. * The literal value or formula that was introduced into the cell. * if the user entered a formula then the result of that evaluation is returned. * the formatted value is returned. That’s it! You have just transformed data coming from a Google Spreadsheet into a List of Maps that you can feed into the Salesforce connector! 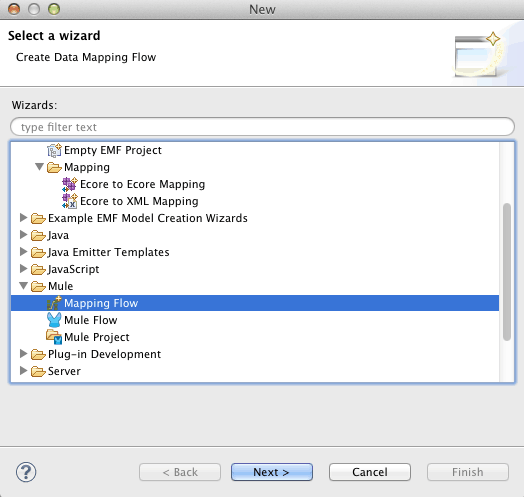 Another use case present on the example is the one in which you have a list of items that you don’t want to map into something else but simply modify it. 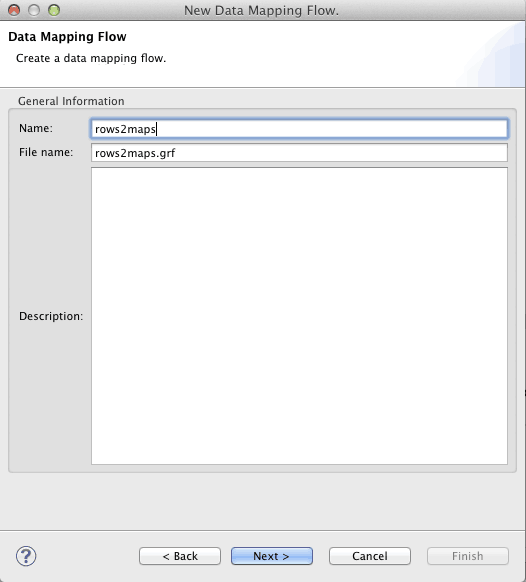 DataMapper can also be used for that by simply defining a mapping in which source and destination are of the same type. Can’t I just do the same with Java or Groovy transformers? You can indeed, and for the simple example we’re about to show that could even be a better approach. However, DataMapper adds value by allowing you to do everything graphically without the need of coding. Also, a DataMapper transformation would be easier to maintain if it turns out that new requirements makes the transformation more complex. In the examples case, what we want is to take the List<Row> that the Google Spreadsheet connectors gave us and change the value of the “AtSalesForce” flag that indicates if that given row has been synced. This simple ternary expression basically says:”if column number is 4 and the rowNumber is not 1 (because at row one we have the headers) the map a “Y”, otherwise, just use whatever value the source carries. That’s it, you just modified a value in a nested list of objects without writing one single line of code!! The two sides of the mapping look a like but there’s one small difference: The one at the right has lost the AtSalesForce flag. No particular reason for that other than in the context of the example app, that flag was no longer needed after the transformation. As before, DataMapper has automatically filled the obvious transformations but, wasn’t this about filtering? Yes it was! 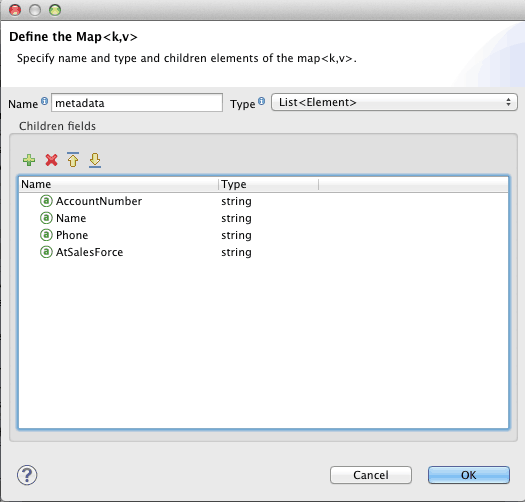 This mapping is going to be fed with a List<Map<K,V>> in which some of those maps are going to have an entry with key “AtSalesForce” with a value of “Y” and others are going to have a value of “N”. We want to loose those and generate a List<Map<K,V>> in which only the entries with the “N” remain. So the condition is clear, do the mapping if AtSalesForce has “N” as a value. Otherwise, that particular element is dropped. 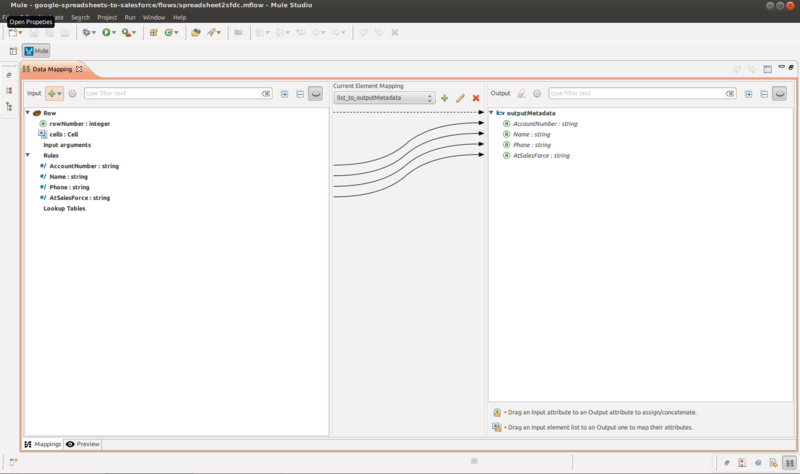 DataMapper documentation shows you the basic and most common use cases for it. I hope you have find this useful. Remember that if you want to check out the code of the example app you can find it following this link. Please reach out with any comments/questions.